The gleaming edge of what looks like an oversized cookie-cutter plunges into a sheet of clay. Before punching out another tile, a man in a red apron dips the cutter in a bowl of WD-40. This ensures each cut he makes come out as clean as possible. He alternates back and forth between the two until he fills up an entire board with Moroccan fish scale tiles. Then he stacks a piece of drywall on top to draw the moisture from the clay over the next three days. 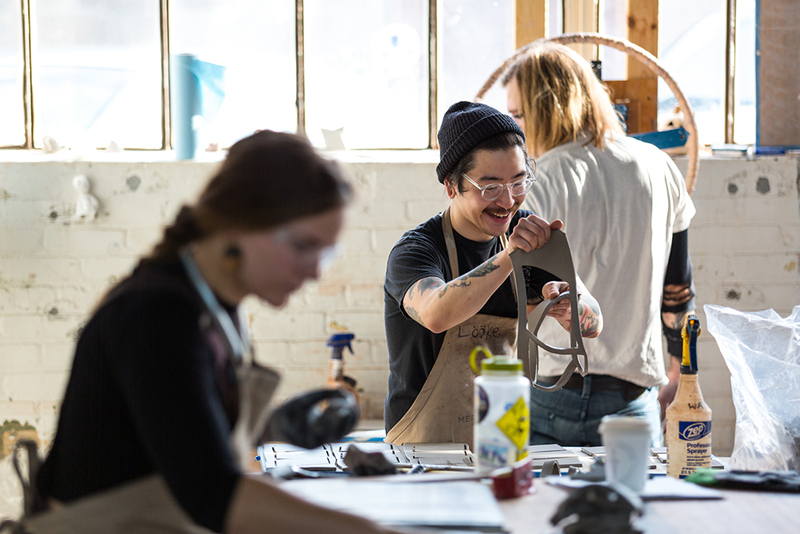 The Mercury Mosaics factory that opened mid-June—with its rock music, tattooed millennials and flood of natural light from 24-foot-high ceilings—looks like a modern-day take on the industrial manufacturing spaces that once ruled Northeast Minneapolis. 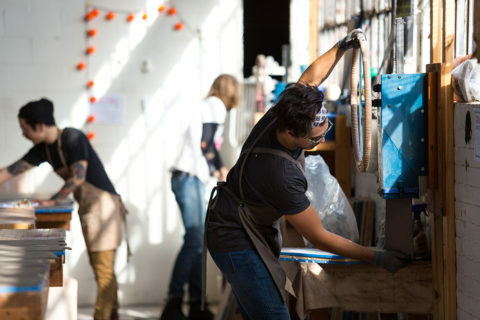 Here, 25-pound blocks of clay are squeezed through die cut molds using a hand-cranked extruder before being shaped, glazed, and fired into colorful tiles that adorn the walls or floors of tastemakers and tech giants alike. It takes smarts, too. 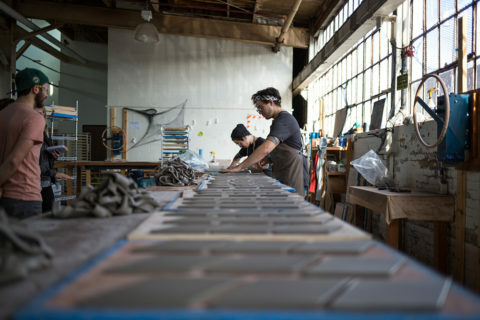 The artists on the production floor, known affectionately as “tile elves,” are constantly running numbers. They know how many small diamond or penny round tiles fit into one square foot clay, and how much each piece will shrink once it’s dried and fired. Before design-savvy Instagrammers began snapping shots of tiled floors, Mercedes was already well on her way to building a tile mecca in the Midwest. Mercury Mosaics is one of the only handmade tile companies in the world that creates custom mosaics that allow businesses and homeowners to individualize their spaces. Yet, like the clay in Mercedes’ factory, the Minneapolis-born artist went through her own transformation. For years she battled addiction, but now she spends her time figuring out how to support the 26 artists who work under her. Since 2010, her team has quintupled the amount of tile it cranks out each year—from 8,000 to 40,000 square feet. Their work has popped up on the walls of local restaurants like The Bachelor Farmer Cafe, and has become a common fixture in more than 100 stores operated by the yoga-inspired apparel company, Lululemon. For people who want to add a personal touch to the interior of their home, Mercury Mosaics is the ticket, says factory boss Zak Shaw, who has worked on thousands of home-improvement projects. There’s a certain amount of magic involved when you unload a kiln. When you crack the lid, heat radiates from the brick and hits your face. 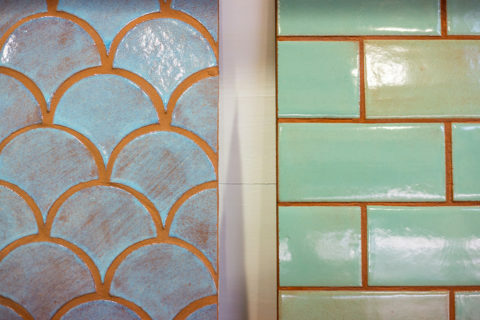 Tiles that once looked chalky and dry now take on the appearance of glossy jewels. There’s something about what you hear, too. A distinguishable ting, ting, ting that reminds Mercedes of what it sounds like to dump out a box of Legos, or what it looks like to see a twinkle appear at the corner of someone’s smile. Each tile has a soul. No two are the same. From start to finish, the process is an exercise in attention to detail and craft. The result is a handmade tile that sets itself apart from the monotony of commercial tile options, which are often limited in shape and color. Like the two-story tall fountain that artist Marco Bravura installed in Ravenna, Italy. Its two twisting forms rise out of the ground like the double helix of DNA and are completely covered in a mosaic a group of students helped him assemble. Or the Lakewood Memorial Chapel, a hidden gem in Minneapolis whose inner dome is covered in more than 10 million mosaic pieces created by the same artists who worked on the Vatican in the early 1900s. “I like this medium because it’s going to be around a lot longer than I’m going to be around,” she says. Mercedes got her start in clay working at a small mom-and-pop shop in Minneapolis in 1999. 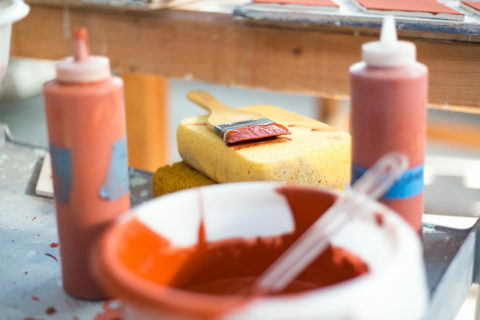 Though she was an artist, she had never worked in clay before. Despite that, something about the medium clicked. By 2002 she branched out on her own after landing her first commission creating ceramic light switch covers for a woman with a custom sound system in her home. 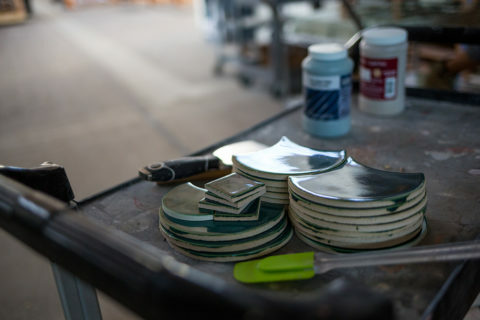 For the first few years of her business, the artist dabbled in ceramic home accessories like coasters and small mirrors, working various part-time jobs to keep her creative practice afloat. 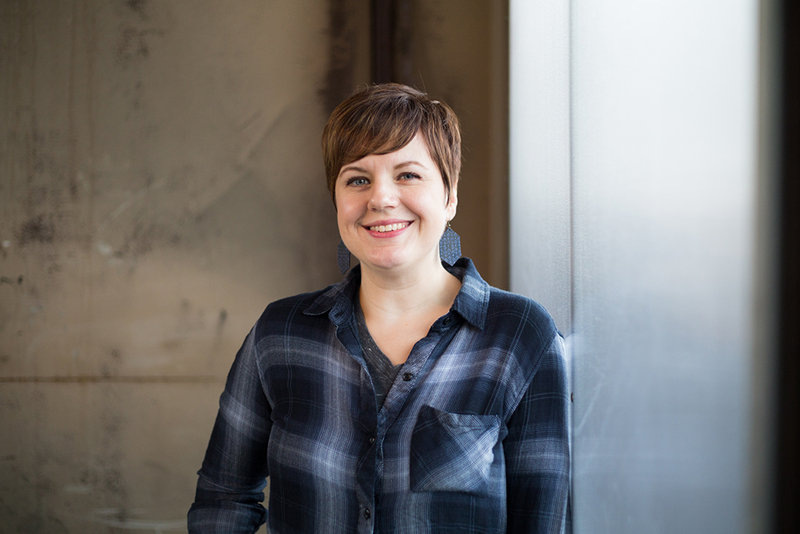 She turned her creative drive into a full-time pursuit after securing a few commercial gigs, like installing nearly 80 square feet of tile at the restaurant, People’s Organic, at the Galleria in Edina. That work convinced her to shift her focus from home accessories to commercial and residential tile. 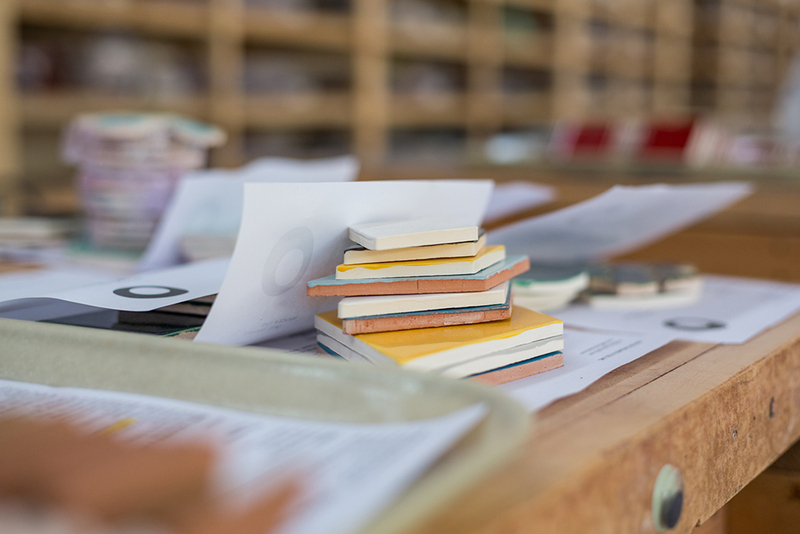 She took her four lines of tile—penny rounds, bubbles, squares, and stix—to a major trade show, picking up 18 showrooms the first year and 30 the next that wanted to carry her work. But the industry hit a bump in her third year when the housing market crashed in the mid-2000s. She picked the latter. The entrepreneur built relationships with design firms and architects, and started working directly with homeowners to make tile an accessible choice for those who wanted to get creative. Unlike other tile companies, Mercedes’ team is able to carry out large, one-of-a-kind mosaics and installations for companies like Whole Foods and Starbucks. The company’s bathroom redesign at the Minneapolis–St. Paul International Airport even snagged the title of America’s Best Bathroom in 2016 for its Minnesota-inspired landscape mosaic. Perched on top of a table, Maggie Morrison sits with her legs bound up like a pretzel as she meticulously glues down one white piece of tile after the next onto a piece of mesh. It will take more than 7,000 penny round tiles, or small circles, to complete the 11-foot crayon mural laid out before her. Once it’s done, the crew will ship it off to be installed at Toy Story Land before the park opens next year in Orlando’s Walt Disney World Resort. “I don’t really have to go to the gym working here,” Maggie jokes. Once all the tiles are glued into place, staff will cut the mesh apart into 12-inch squares. Then they’ll number those pieces so someone else can easily recreate Mercury Mosaic’s tiled vision. Taking a mess of tiles and organizing them into an artful composition was something that drew Mercedes to the work early on. At the time, she was struggling with chaos in her own life. But something changed when she started making tile. Instead of heading out to parties after she got done waitressing, she started going into the shop to work with clay. Now with that lifestyle behind her, she’s determined to make Mercury Mosaics a place where artists can invest in a creative career. 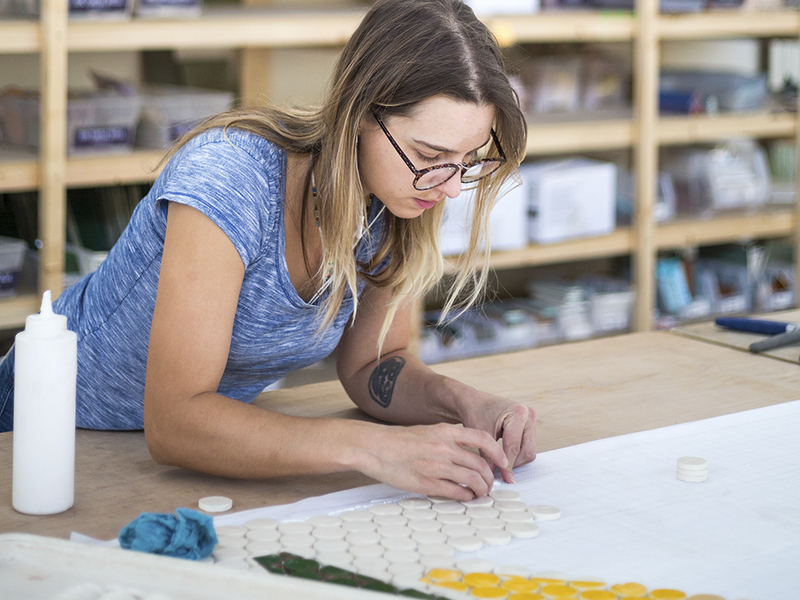 The owner has her sights set on launching an online shop to make it easier to buy handmade tile, and she’s plotting an expansion beyond Northeast Minneapolis. If all goes to plan, she hopes to open other Mercury Mosaic–owned factories in rural Midwestern towns. Those spaces will crank out the company’s handmade tiles en masse, while Mercedes refocuses her original location on becoming the country’s go-to spot for custom mosaic murals. As with tile, it’s just another challenge she’s anxious to straighten out.